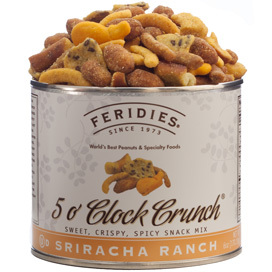 FERIDIES has created several snack mixes with only the finest ingredients for your eating pleasure. You'll find a few that are spicy and some that are simply savory. These mixes are guaranteed to please the crowd! Great for parties, cookouts or for simply enjoying a snack while watching your favorite team. It is easy to love Feridies award-winning Virginia Peanuts. Salted or unsalted or seasoned with a variety of spices, they make a rich, nutritious snack. However, sometimes the taste buds crave something different - not sweet or sour, something with substance. We call that taste savory. To satisfy that craving for savory, we offer an assortment of different snack mixes and a unique spicy trail mix, any of which will hit the spot. All of our snack/trail mixes are OU Kosher Certified, and several are OU Dairy Kosher Certified, for those with discriminating dietary needs. 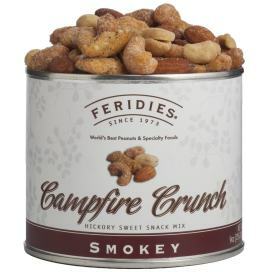 Our Campfire Crunch blends the rich flavor of hickory-smoked Virginia peanuts and almonds with just a hint of sweetness from our honey-roasted Virginia peanuts. For those seeking something a little more adventuresome, we have Seaside Crunch blending salted Virginia Peanuts with crunchy oat bran nuggets and the warmth of roasted pepper and garlic-flavored sesame sticks. 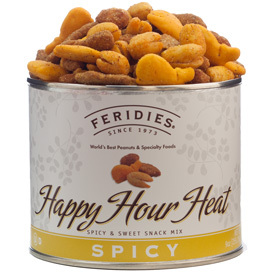 For the truly daring, we have Happy Hour Heat - spicy mix of hot and spicy Virginia peanuts, roasted pepper sesame sticks, cheddar cheese crackers with just enough honey roasted Virginia peanuts to take the edge off. Our Rt. 58 Trail Mix is an outdoorsy blend of Virginia Peanuts, sweet almonds, crunchy pepitas, succulent raisins, sweet dried cranberries and bright fruity papaya. Just the right snack for that next hike. Our snack mixes are a flavorful treat any time, and make unique gifts when you select two, three or four different mixes for one of our special gift boxes.